July 26, 2012, we took another hike to Anna Ruby Falls. With a heart condition, I felt a little reluctant to try it. But it’s only four-tenths of a mile. There are several fairly steep inclines on the trail, but I did fine and made it to the top. Such a rewarding experience. We made lots of friends on the trail who cheered me on. One lady was ninety. Anna Ruby Falls marks the junction of Curtis and York Creeks. Both creeks originate on Tray Mountain and are fed by underground springs, rain and snow. 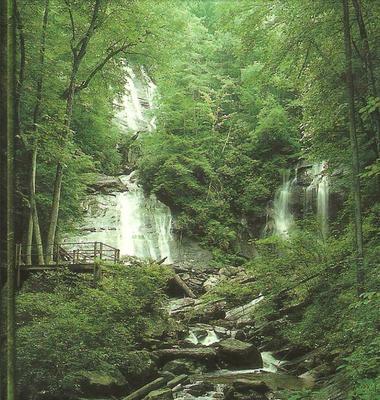 Curtis Creek drops 153′ and York Creek drops 50′ forming the twin waterfalls known as Anna Ruby Falls. The falls was purchased by Colonel John H. (Captain) Nichols. Captain Nichols named the twin waterfalls in honor of his only daughter.